Would you love the thrill of outmanouvering a murderous tyrant, a vengeful ghost, or a mindless zombie? Enjoy the horror escape games experience from some of the finest escape room establishments. Do you want to make an informed choice on the best room escape games? Check out our expert and peer reviewed games for the best options. Picking through hundreds directory listings can be overwhelming. Simply check through our best reviews for top rated escape the room games in your area and worldwide. What's new on the escape games scene? Update yourself with our most recent reviews to get a feel of best practices and quality standards for a memorable experience. 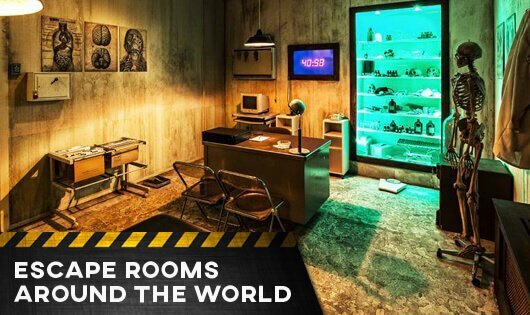 Share your insights with our worldwide community of escape room enthusiasts as we celebrate our shared escape the room passion. Imagine walking into a room set up as the filthy bathroom portrayed in James Wan’s movie Saw (2004) with a creepy and spooky voice feeding you puzzles to solve in order to secure your escape. This is the general idea behind horror escape games. They are purposely designed to be scary and the story-line has a do-or-die spin. Horror escape games give you the real world interactive experience of starring in a terrifying movie. Often, participants are chained, duct taped, hooded, or blindfolded to deny them of a few of their senses. A game master, often chosen for his creepy voice (it’s always a male, right?`) will state out the rules, provide puzzles, and warn participants of the dire consequences of not making it out before his return. What else makes for truly terrifying yet compelling horror escape games? Like all escape rooms, a horror escape games will be ranked based on its difficulty level. Some will be easy enough to be cracked by a small team of 4th graders, others might be complex enough to challenge college students. When making your booking, you need to ask for age recommendations and the complexity level. You don’t want to end up “dead”, neither do you want to be so bored with puzzles that lack imagination. Complexity levels are usually depicted by success rate percentages. The lower the percentage, the more difficult the room. Horror escape games usually have a terrifying, sadistic, and psychopathic predatory villain. Whether it’s based on Jigsaw (The Movie Saw), or demon-possessed individuals (think Resident Evil), cannibals, zombies, a serial killer, or an otherworldly being, you need to escape before they appear. Always arrive at least 30 minutes before your scheduled participation. This is because the game master uses this time to explain the theme and storyline. Without this debrief session, it may be impossible to find any of the codes, clues, and puzzles. And even when found, cracking them might be a tall order. Most horror escape games storylines are woven around the murderous villain whom you need to get away from within a limited period (mostly one hour). The more detailed the storyline is, and the higher the quality of the props, the better the immersive experience. While some other types of escape the room games may not be so prop-intensive, horror escape games work best when detailed props are used. They work with the storyline to induce the fear factor and get your adrenaline pumping.